How to Create the Perfect Cereal - U-RAAW! Creating your own customized cereal can be a little overwhelming with all of the potential ingredient choices, so we decided to write a short guide that outlines the process. The steps below will work whether you are building your own customized cereal at U-RAAW!, or at home. Before you begin, we recommend taking a little time to think about what the flavour and texture you are trying to create before selecting your ingredients. Many people simply choose as many different ingredients as they can, but this doesn’t always result in the best tasting cereal in our opinion. Did you want the cereal to be crunchy, fruity, chewy, sweet, nutty etc.? Once you decide the end result you are aiming for, the ingredient process becomes much easier. Choosing a base that you like is important, because it makes up the majority of most cereals. *We recommend choosing 1-3 ingredients in this category. If you are building your cereal at U-RAAW!, you have already selected your size and all of the calculations will be automated. If making a cereal from home, we recommend starting with 340g of base. Highest in antioxidants / nutrient density: Buckwheat hearts, chia seeds. When it comes to choosing the nuts and seeds in your cereal, you really can’t go wrong with any selection, as long as you choose ones that you like. If you want one particular flavour to stand out more than others and are picking more than one from this category, be sure to choose more grams of that particular nut or seed. *We recommend selecting up around 60g of nuts or seeds per 340g bag of cereal. If you are building your cereal from home you will need to make a few calculations at this point. Since you have already selected your base (340g), you must now subtract the number of grams of nuts / seeds you select from your base. So for example, if you selected 40g of dried fruit, you would subtract this number from the 340g base ingredients. Our favourites: Cashews, chia seeds. 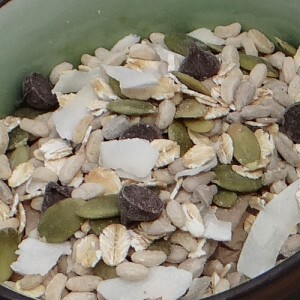 Most popular: Almonds, pumpkin seeds. Highest in antioxidants / nutrient density: Almonds, chia seeds, hemp seeds, pecans, sacha inchi seeds. Adding dried fruit to your cereal is optional but highly recommended. 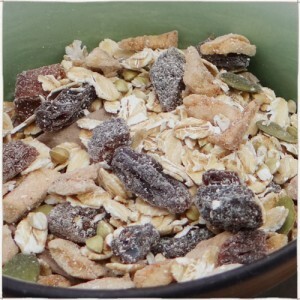 It’s a great way to naturally sweeten your mix and add a little chewiness to each bite. All of the dried fruit we offer contains no sulphates or preservatives, and we recommend that if you are creating your own cereal at home you also use preservative-free dried fruit. *If you decide to add fruit to your cereal we recommend selecting 30-60 grams of dried fruit. Again, those building there cereal at home will have to subtract the number of grams of dried fruit they select form their base. Highest in antioxidants / nutrient density: Goji berries, golden berries, tart cherries, white mulberries. You might want to add something sweet, salty, or chocolatey to your cereal, and this category has plenty of options to choose from. *If you decide to add treats & goodies to your cereal we recommend selecting around 30 grams. 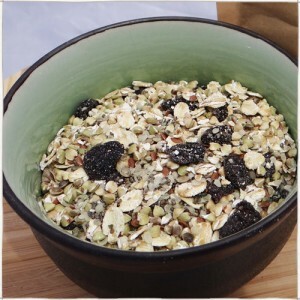 As with nuts & seeds and dried fruit, you will have to subtract the number of grams from your base. Our favourites: Cacao nibs, dark chocolate almonds. 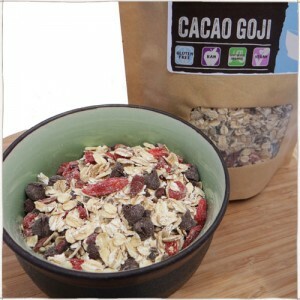 Most popular: Cacao nibs, maple almonds. And there you have it… a simple guide to creating your own delicious homemade cereal! Be sure to visit our Custom Cereal page to build your own organic gluten-free cereal that we package up and ship to you. You can even create your own custom label! If you still need help creating the perfect mix please send us an email or give us a call and we’d be happy to assist.